English synchronised swimmers Katie Clark and Olivia Federici are putting the finishing touches to their preparation for the Olympic Qualification Tournament in Rio from the 2 – 6 March. Clark and Federici returned to full time training at the start of 2016 following their selection onto the British synchronised swimming Duet squad training for qualification to the Rio 2016 Olympics. The pair have spent the past few days in Rio, training under the eye of coach and fellow London 2012 teammate Katie Chapman. Karen Thorpe, British Synchro Team Leader, said: “Katie and Olivia have had an extremely positive start to the season in their bid to qualify for the Olympics. “The Olympic Qualification Tournament in Rio will be a challenge for us. We will need to be at our very best on that day in Brazil but both Katie and Olivia have worked really hard since returning to the pool and their progress is evident every day. Clark and Federici made an encouraging start to 2016 with a top ten finish at the German Open, their first international competition since the 2013 World Championships. The pair then showed significant progress a week later at the French Open. Clark and Federici will compete at the Maria Lenk Aquatics Centre as they aim to secure a quota place for Great Britain at the Rio 2016 Games this summer in the Duet event. 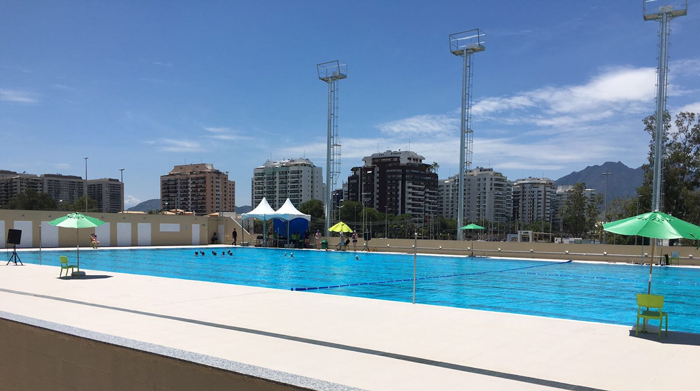 The newly refurbished Maria Lenk Aquatics Centre is situated at the heart of the Rio 2016 Olympic Park which is on the south side of the Brazilian capital. The venue will also play host to the synchronised swimming and diving at the Games in the summer. The 11 best ranked NOCs in the Duet competition at the FINA Synchronised Swimming Olympic Games Qualification Tournament who have not already qualified a team will each obtain a quota place for Rio 2016.